One thing I love about yoga is that it focuses on the union between the mind and the body, the head and the heart. We aim to strike a balance between effort and surrender and strive to do the hardest things, with the greatest amount of ease. It's something I take to heart whether I'm on my mat or off. Any yogi will tell you that in the beginning, myself very much included - downward dog did NOT feel like a resting pose and my version of "floating to the top of my mat" was more like thudding to the top of the mat. But as time went on and I continued with my practice I started to feel lighter and I wasn't as exhausted by the third vinyasa or dying to just crawl into childs pose like the first few sessions. I realized over time that overexerting was actually hindering my practice and holding me back - that there was a moment in each pose where my physical effort needed to be met with surrender so that the pose could actually get me into my body instead of the other way around. It's like those times in life when we try to hold onto a situation too long in an effort to control the outcome, expend too much effort and often end up exhausting ourselves unnecessarily. 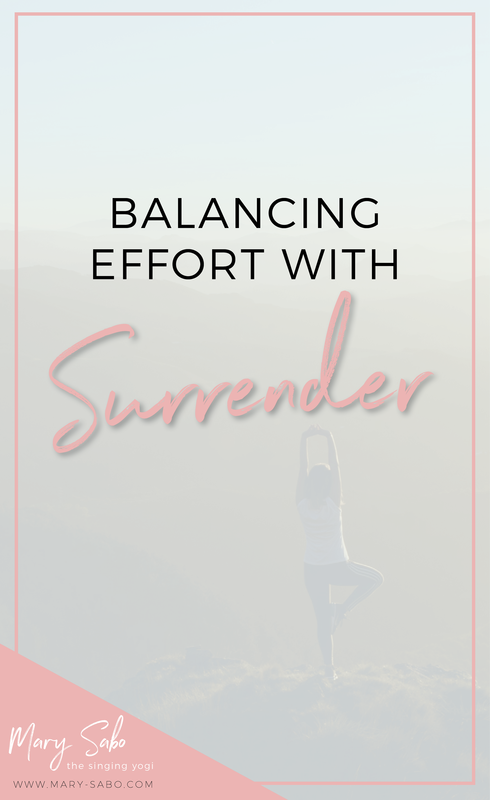 Recognizing when it's time to surrender our efforts in any given situation can be an incredibly effective way to get more done in our life, reserve our energy so we can then allocate it in an increasingly productive way. Send me the FREE series! Finding ease isn't always easy, it requires practice, patience and persistence but the reward is so very much worth it. It is what gets us accessing our flow state.